A new Hilton hotel, along with a small village of boutique shops, is currently undergoing construction on a secluded block of land jutting out into the sea in Gijang County. The location is just north of Busan’s Haeundae Beach, one of Korea’s busiest coasts famed for its lively nightlife. The new five-star Hilton Busan, however, seeks to offer a quieter getaway, introducing a more refined type of tourism to the seaside city. “We think there is a large market for both locals and tourists who want to disconnect from their lives and reconnect with their family and loved ones. 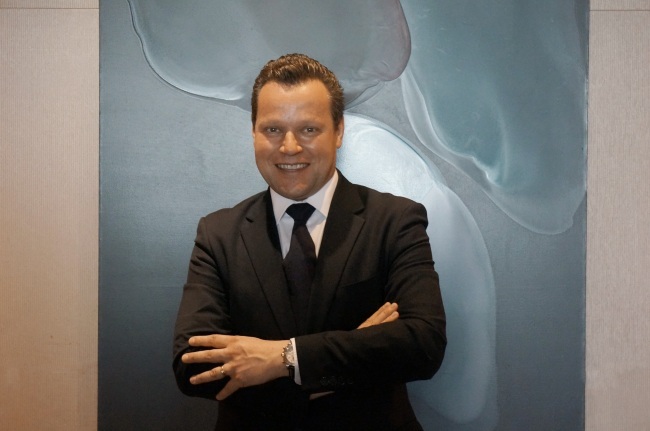 They want to enjoy a more private time,” Jean-Sebastien Kling, cluster general manager of the new resort hotel set to open in July, told The Korea Herald in an interview at the Conrad Seoul on Thursday. The hotel seeks to offer an array of services -- premium food, leisure, shopping, event and wedding venues and more -- while blending in with natural environment, Kling said. Designed with multilevel terraces and a rooftop pool, visitors will “get the impression they are floating above the middle of the ocean,” he said. Rooms on the opposite side, meanwhile, will offer panoramic views of the mountainside. The new hotel targets several clientele bases -- locals seeking nearby relaxation, people from nearby countries such as Japan and Taiwan seeking a serenely blissful spot for a destination wedding and tourists who want to explore the calm, natural beauty of Korea. Reservations can be made prior to the opening at www.hiltonbusan.hilton.com.